Law Web: Whether proper service of summons can be presumed even if summons were sent at wrong address? 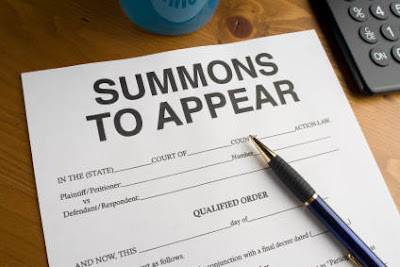 Whether proper service of summons can be presumed even if summons were sent at wrong address? It is abundantly clear from the reading of this rule that the summonses must be sent for service but in cast they are not served and they are returned, then alone the provisions of this rule are attracted. This Rule 20-A cannot be construed to mean that even if the summonses are sent in a wrong manner, or at a wrong address or to a wrong place and they are received back, service by registered post is permissible. This rule contemplates an attempt and a genuine attempt of the service of summons in the ordinary course. If service is not possible and the summonses are returned then of course mode of service of summons by registered post can be resorted to either in lieu of or in addition to the service under the ordinary course. The proviso added by Rajasthan State in Order 5, Rule 10, C.P.C. gives discretion to the court to send the summons to the defendant by registered post in addition to the mode of service laid down under Order 5, Rule 10. C. P. C. As noticed above on 19-10-70 summonses were ordered to be sent in ordinary course and service by registered post was also directed to be done in addition to it. But it transpired that the notices which were, sent in ordinary course were not properly done. The plaintiff furnished notices only in Hindi and they could not have been served on any person in the State of Andhra Pradesh. Thus there is a clear violation of Order 5, Rule 10, C.P.C.